On 15 December 1992 Christie's sold the remaining contents of Penkill Castle, near Girvan in Ayrshire, where the Pre-Raphaelite painter William Bell Scott had lived for many years with his pupil and mistress Alice Boyd. .The ancestral home of the Boyd family since the thirteenth century, Penkill was the last Pre-Raphaelite house that had retained at least Some of its contents and remained in pnvate hands. Before the sale there was much talk of acquiring it for the nation; if this had happened the castle would have become Scotland's answer to Kelmscott Manor. William Morris romantic house in the Cotswolds which belongs to the Society of Antiquaries and is open to the public. The items which comprise the following posts left Penkill some years before the 1992 sale. but in their ability to evoke the atmosphere of the castle and the personalities of Scott and Miss Boyd they resemble much of the material dispersed at that time. The couple first met in Newcastle in March 1859. Scott was forty-eight. master of the local Government School of Design, talented as both artist and poet, fascinating to women but unhappily married. Alice was thirty-four, attractive. unmarried, and looking for someone to help her develop her skill as an artist by way of distraction following the death of her mother. It was hardly surprising that they fell in love. especially as Alice had been fatherlass from infancy and was therefore particularly susceptible to an older man. When Scott visited Penkill in July 1860 and fell equally heavily for this miniature castle, recently lovingly restored by Alice's brother Spencer. the current laird. all the elements needed for a Lasting romance were in place. The couple remained devoted until Scott's death in 1890, and Alice mourned him until her own death seven years later. In 1864 Scott gave up his post in Newcastle and moved to London. settling in Elgin Road. Notting Hill. At this period Spencer Boyd was still a central figure in Alice's life, but in February 1865 he died suddenly of heart failure, leaving her bird of Penkill. From then on Alice's dependence on Scott was complete. A practice grew up whereby she spent the winters with him and his wife in London (transferring with them to Bellevue House. Cheyne Walk. when they moved there in 18711 to he near Scott's friend D.G. Rossetti), and they spent the summers with her at Penkill. The menage ti trois worked remarkably well. The two women remained friendly, Mrs Scott was complaisant about her husband's liaison, and no-one questioned the propriety of the situation. Life at Penkill in its heyday. before Scott became bed-ridden in 1885 with recurrent attacks of angina. was idyllic. The castle is perched on a promontory above a glen carved by the Penwhapple bum, the babbling music of which is seldom out of earshot. With the help of Spencer Boyd's Conner factor. Scott made a delightful old-fashioned garden, while from the crenellated and turreted battlements could be seen an extensive view of the Firth of Clyde and Aisa Craig. The easy going but cultured lift which the two artists created for themselves - aptly described by Michael Hall in a Country Life article (21 March 1991, p.118) as a 'relaxed atmosphere of art and animals, whisky, friends and endless talk' - led many of their circle to visit this outpost or Pre-Raphaelitism north of the border. Christina Rossetti. who, according to some. was in love with Scott herself. went as early as 1866. staying in one of the turret bedrooms, and her brother Dante Gabriel paid two visits in 1868 and 1869. Even Penkill could not assuage his creeping melancholia. During the second visit, though it was productive of sonnets inspired by his love for the absent Janey Morris, he alarmed his boasts with his talk of suicide and insistence that a chaffinch that settled on his hand was the spirit of his dead wife, Lizzie. How different front the hearty Dutchman Alma-Tadema, who took a daily shower in the Penwhapple's waterfall! Scott saw himself as essentially a history painter. 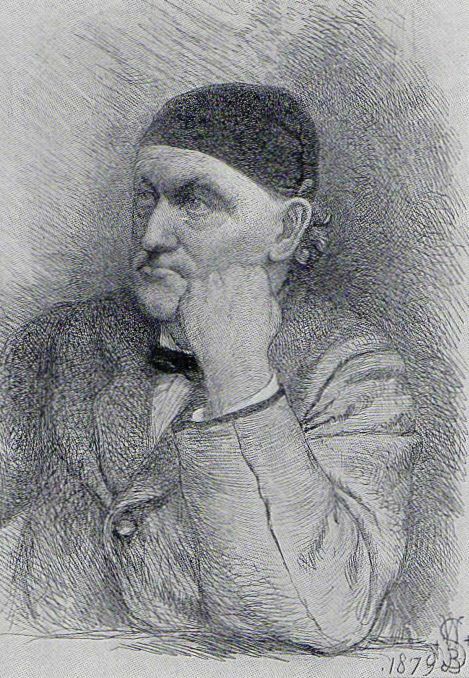 Historical themes had been the forte of his short-lived elder brother David, and, like him, he had entered the Westminster Hall competition in 1843. Although unsuccessful. in 1856 he was offered another opportunity of this kind when Sir Walter and Lady Trevelyan commissioned him to paint murals illustrating scenes from local history in the saloon at Wallington Hall. Northumberland. These paintings. completed in 1861, are undoubtedly his materpiece. When Spencer Boyd died four years later. Scott embarked on a amber set of murals on the spiral staircase at Penkill, using them to explain his prolonged visits to the castle. which lie realised might cause gossip. His subject was 'list King's Quair, a poem in the conventional medieval form of a love-vision by James 1 of Scotland. The paintings, which, like the Wallington cycle, survive and contain portraits of the artist and his friends, took three years to complete . Scott's interest in historical subjects also found expression in the easel paintings which he exhibited for many years at the Royal Academy and elsewhere (lot 95). but he came to feel that they were not appreciated. writing bitterly of those he would have painted 'if the RA had treated my pictures with a grain of consideration', and ceasing to exhibit them, indeed to exhibit at all, m 1870. Although he continued to paint historical themes, it was generally on a small scale, while more accessible genres increasingly claimed his attention. He turned to portraiture, painting the Trevelyans, their young friend A.C. Swinbume (lot 102), Alice and her numerous Losh relations. Under the soothing influence of Penkill, he developed his interest in landscape, finding endless inspiration in the Penwhapple glen. the surrounding countryside and nearby coast. He also undertook considerable literary labours, editing the works of Keats, Byron. Coleridge, Scott, Shelley, Shakespeare and others, as well as continuing to write poetry, an art-form he had practised since youth and which had in brought him to the attention of Rossetti in 1847. His last lifetime volume, a hundred short lyrics entitled A Poet's Harvest Home was published in 1882. Perhaps more than most men. Scott needed the balm of Penkill and it's pretty, talented. affluent chatelaine. Lady Trevelyan called him 'Mr Porcupine'. and he was certainly a prickly personality. This comes our very strongly in his Autobiographical Notes, published postuhumously in 1892, with its trenchant. crotchety comments on his friends and the two etched self-portraits, in which he seems to take a wilful delight in making himself look grumpy and beligerent. A Scot by birth, he undoubtedly had his share of the native crustiness, but it was exacerbated by circumstances-professional disappointment, probably the frustration of his failed marriage. perhaps even the indignity of the attack of alopecia which he suffered in 1862. This caused him to lose his hair, moustache and eyebrows, and with them the 'archfiend expression' which may well have constituted a large part of his attraction for women. From then on he always wore the black velvet skull-cap which is seen in his later portraits and photographs. The formal sources of Scott's art were complex. He studied at the Trustees' Academy in Edinburgh. and was trained by his father. Robert Scott. as an engraver, the origin of his lifelong practice of etching. It was also through his father that he acquired an abiding interest in Blake. In London in the late 1830s he mixed with Richard Dadd. W.P. Frith, A.L. Egg and other members of 'The Clique', while his meeting with Rossetti brought him into the Pre-Raphaelite circle and exposed him to the vigorous concept of 'truth to nature. During his visits to Italy in 1862 and 1873 we find him copying the Renaissance masters. But the most consistent influence, encouraging the nervous, edgy quality that is so characteristic of his work, was German art. His background gave him a profound sympathy with the early German masters of print-making, particularly Durer with whom he identified closely. Like so many British artists concerned with mural painting. he was also well aware of the modern German painters who had pioneered the mural revival, and it has been suggested that the intensity of sonic of his landscapes shows the influence of such German Romantic artists as Caspar David Friedrich. The impact of German art on Scott is thither betrayed by his three books on the subject - a life of Durer (1869), a monograph on contemporary German painting (1873), and an introduction to die so-called 'little Masters' (1879). all produced during the Pcnkill period. Not surprisingly. German artists also figured prominently in his enormous collection of prints. dispersed at a five-day sale in 1885. Devoted to Scott personally and painting with him daily, Alice inevitably reflected his work in hers. Like him, she painted literary and historical subjects, portraits and landscapes. She illustrated his poems. selected similar views, and captured something of his neurotic sensibility and rather stringy sense of form. When he died in 1890, she lost heart and more or less gave up painting. For some eighty years after her death Penkill remained in the possession of her a Sleeping Beauty's palace virtually untouched. Its recent history has been more chequered. but although its preservation as an entity was unfortunatly not realised, we can still picture it in its Victorian heyday, providing a fairy-tale setting for the bittersweet romance of these two remarkable souls. Thanks Hermes to share bio of William. I love and enjoyed while reading.